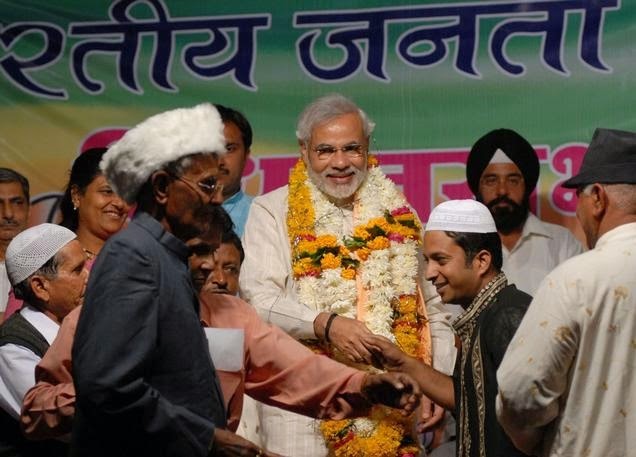 Gujarat may be claiming to have ushered in a new era of communal harmony, pushing the 2002 communal riots to the backdrop. But reports from Gujarat suggest Muslims traders are angry over alleged efforts to close down their business in different parts of the state. This is happening not just around the Jain religious shrine of Palitana in Saurashtra, where meat and egg shops are banned, but elsewhere in the state as well. Palitana, it may be recalled, is situated just about 60 kilometres from Bhavnagar town, where Vishwa Hindu Parishan leader Pravin Togadia offered advice to Hindus on how to prevent Muslims from buying property in areas where they are in the majority. Commenting on the development, a minority-controlled website, kohram.in, said, Prime Minister Narendra Modi’s brain child Vibarant Gujarat will be held in the State this time under the leadership of the chief minister, Anandiben Patel, and this time western diplomats and investors are making a beeline to seek favours from Gujarat. But all this is happening ahead of Muslims are not being allowed to do meat business and egg business around Palitana. Meanwhile, reports said, 10 Gujarati Muslim traders have alleged that they were being forced to close down businesses over the past one month. “The latest complaint was been filed on Thursday by hotelier Mustafa Patel, who claims to have shut down his Jyoti Hotel on Viramgam highway, 90 minute drive from Ahmedabad, after receiving threats”, they added. The complaint by Patel said that “despite court orders the police has refused to provide him protection”. Already, according to reports, the National Commission for Minorities (NCM) has received several complaints from Gujarat on this. NCM chairman “Wajahat Habibullah sought reports from the Gujarat Government”. “Those who have been forced to close down their business are Kasim Ahmed (scrap dealer), Ahmed Arif (minerals), Farooqbhai (power production unit), Yakub Mohammad (mineral production), Saifudin Ali (power production), Ahmed Khoka (power), Shabir Bhai (mineral production), Majid Khan (power) and Harun Abdul Malajher (mines)”, the reports point out. The reports, however, quote Gujarat government spokesperson and senior minister Nitin Patel refuting the claims. “There are thousands of minority traders and merchants prospering in Gujarat. Hundreds are doing their business in the walled city areas of Ahmedabad”, the minister said.